Scheduling meetings is painful, time-consuming, and complicated. 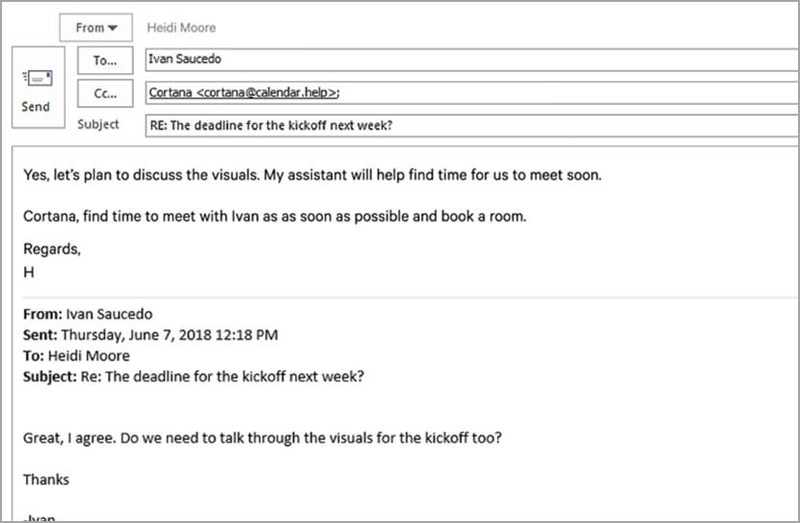 By now, however, you’ve hopefully heard of & used Microsoft FindTime™, Microsoft’s self-service solution for Office 365 users that facilitates meeting scheduling between both internal & external participants by automating the process of sending inquiries regarding each person’s availability for a meeting. This solution has been readily available for Exchange Online/Outlook 365 & delighted Office 365 users for more than 2 years! Move over FindTime. There’s a new assistant in town to both automate & expedite the scheduling of meetings for Office 365 users and it’s called Calendar.help. Calendar.help does one thing really well: Quickly schedule meetings for you with other people based on everyone’s availability. You simply put “Cortana” on the cc: and instruct her in the email body as to what you want to schedule. Need to schedule a meeting quickly based on each team member’s schedule availability? Want to invite external participants, not part of your organization? Need to find an available room or want a specific conference room? Want to schedule a Skype for Business or Microsoft Teams meeting? Need to specify an external location like “the Starbucks on 5th & Broadway”? Want to work around other people’s timezones? Need to schedule a meeting between a job candidate & a hiring manager? Saves you time – To use Calendar.help, cc: Cortana in an email with other people and ask her to schedule a meeting. Cortana handles all the back-and-forth emails to find a time when everyone can meet and then sends out an invite on your behalf. Schedules intelligently – With the speed of artificial intelligence and the personal touch of a human assistant, it’s the best of both worlds. Cortana communicates with your contacts by email to provide a natural, almost human, scheduling experience. Knows your calendar – Calendar.help works with your Office 365, Outlook.com, or Google calendar. Cortana, using Calendar.help, knows your meeting preferences and uses them to find the best times.